Sunday afternoon at Carmines, originally uploaded by Goggla. I just found out today that after 107 years, Carmines down at the Seaport is no more. This was one of my favorite hang-outs on a Sunday afternoon and the bartender (pictured) was the best. This was one of those old places that embodied the character of the old Seaport, before the Fulton Fish Market moved to the Bronx and the before the tourist mallification of the neighborhood. Anyone who has read Joe Mitchell's 'Up In The Old Hotel' has an idea of that old gritty fisherman vibe...now, no longer. Such a shame and a loss...add this to the ever-growing list of discarded NYC cultural treasures. Great photo--I am sorry I missed this place. This closure really hurts. I loved this place for drinks. (Food...eh....) Do you remember the bartender's name? What a character. He always had some stories.... and opinions! Y'know, it's killing me because I can't remember his name and I know I know it...one too many drinks, I guess! Yeah, I loved this guy as well as many of the customers. What a treat to walk into the cozy coolness of this place after being out in the mayhem of the seaport and finding so much great conversation and company. I think I was last in there two weeks ago, so they must have known they were closing at that point, but I had no inkling of it. The garlic bread with cheese was to die for. I'd never heard great things about the food, but I asked the bartender to recommend something and he served up a GIANT platter of pasta with every kind of seafood and marinara sauce...wow. And now, knowing that was my last meal there, it's one I'll definitely remember. I was all set to have a happy half-day Friday, and now this has totally depressed me. 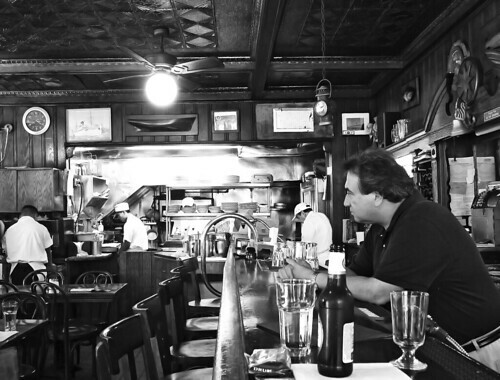 This was one of my favorite NYC places, but now it's gone, Chumley's is probably gone, and about the only old-timey place I have left is the Ear Inn. Thanks for letting me know, though. It's probably better that I find out here, rather than walking past in a few weeks and seeing it first hand and then collapsing in a puddle of tears right there on the sidewalk. Aaron - yeah, the closure happened suddenly and without any explanation. Some have said it was the rising rent, but no official word has come out yet. It's disturbing to see so many institutions close at this point in time when it feels like the city is losing its personality so dramatically. Someone just left a comment over at Lost City, saying Carmines will reopen!